Special Topics Workshops are facilitated by Syracuse University faculty and are open to secondary educators for discipline-specific professional development experience. Certified SUPA instructors have the added option of enrolling in these workshops for SU graduate credit at a significantly reduced tuition rate. The Advanced English workshops address current topics within the fields of literary, cultural, composition, and rhetorical studies—to communicate enhanced content knowledge and classroom pedagogy—as well as topics of broader significance for teachers in the arts and sciences, e.g., research strategies across the curriculum. Workshop participants have the opportunity to enroll in one or two workshops during the five-day retreat. Syllabi, required textbook lists, and any course readers for the workshops will be sent to participants upon receipt of the registration form. The collision of texts, sound, images, databases, and other digital media in which we swim provide a myriad of opportunities to combine, compare, create, question, and remix as a part of our composition process. In this course, we will theorize those opportunities and bring our ideas into playful practice. We will grapple with the ways working digitally invokes the analog, and consider how analog modes can complicate our digital practices (and vice versa). With a dual emphasis on making use of resources in the classroom as well as in our own writing, we will approach research and composition problems through sounds, maps, zines, memes, finding opportunities to begin, revise, transform and understand through media interactions. Along the way, we will focus on how exploration and production across different media can stimulate and guide composition and research while provoking information literacy. Having equipped themselves with a variety of tools and strategies for addressing multimodal approaches to research and writing, at the conclusion of the course, participants will create either a lesson plan or develop new creative work that incorporates these ideas. Reading and analyzing a range of contemporary flash nonfiction pieces and essays on the craft of creative nonfiction. Practice in the craft of composing flash nonfiction, including brainstorming, conducting research, and experimenting with the tools and conventions of the genre with the aim of developing a portfolio of flash nonfiction work. Participants at all levels are welcome; no prior experience with creative nonfiction is necessary. Patrick Williams is librarian for literature, rhetoric, and digital humanities in the Syracuse University Libraries. He studies past, present, and future technologies of reading and writing. Patrick holds a BA in English from The University of North Carolina at Greensboro and an MS and PhD in information studies from The University of Texas at Austin. His writing appears in The Bennington Review, Poet-Librarians in the Library of Babel, The Critical Library Pedagogy Handbook, The Journal of Academic Librarianship, The Canadian Journal of Information and Library Science, Heavy Feather Review, Posit, and elsewhere. Ivy Kleinbart has taught academic writing and creative nonfiction at Syracuse University since 2005. She co-leads the Syracuse Veterans’ Writing Group and serves as a Faculty Liaison for SU’s Project Advance. She co-edited The Weight of My Armor: Creative Nonfiction and Poetry by the Syracuse Veterans’ Writing Group. Her poems have appeared in such places as Collateral, Cactus Heart, Stone Canoe, Bateau, and Notell Motel. Syracuse University’s Minnowbrook Conference Center is an enchanting facility built in the rustic elegance of the Adirondack “Great Camp” tradition. Room accommodations are spacious and comfortable. They will be designated single occupancy, unless registration numbers require room sharing. All meals will be provided by the kitchen staff at Minnowbrook, as will snacks throughout the day. Meals are gourmet quality and participants are guaranteed to never go hungry! Recreational facilities—including a game room, workout equipment, tennis court, canoes, kayaks, paddleboats, and rowboats—are available for participants, and of course, the Adirondacks themselves offer great opportunities for hiking and other outdoor sports. Participants have several registration options for the Special Topics workshops. Most register for one workshop only. Graduate credit is optional, and this specially reduced tuition rate ($210 for 3 credit hours) is available only to SUPA certified instructors. See directions on the Minnowbrook registration form for submitting the Graduate Credit Registration form. 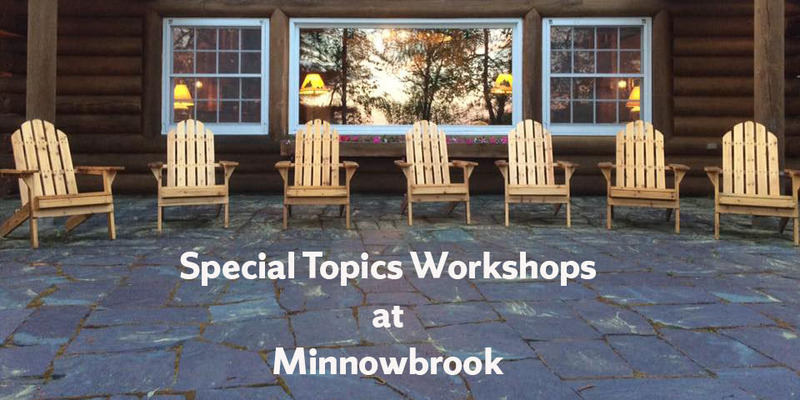 What do past Minnowbrook participants say about their experience?